Tickets for Chenonceau can be bought from vending machines of ticket windows at the chateau or online in advance. Prices are the same. Château de Chenonceau is the most popular chateau to visit in the Loire region and in France second only to the Palace of Versailles. This most romantic of castles is privately owned and ticket prices are slightly pricier than average for the region. Tickets can be bought at the chateau entrance from regular ticket windows of vending machines. Tickets are also available online but still require a physical paper printout. Family discounts are not offered at Chenonceau. Admission to the palace and garden at Chenonceau is €11 for adults and €8.50 for children 7 to 18 and students. A free brochure (available in 16 languages) is probably sufficient for most visitors. Alternatively, add €4 for an audio-video guide. Add €2 for the (very much missable) wax museum. 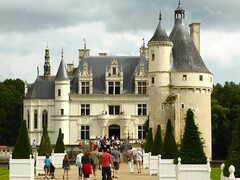 Reservations are not possible or necessary as the chateau is seen without a guided tour. Tickets can be bought from ticket windows or vending machines. There are several vending machines, so move on if the first ones are crowded. Tickets can also be bought online but must be printed out and are only valid for the day specified at time of purchase. Online tickets can be bought even on the day of admission. The ticket price is the same irrespective of the way of purchase or manner of payment. Château de Chenonceau is privately owned and like other privately owned chateaux in the Loire region charges for children and young visitors. No family tickets are on sale while groups of 20 or more qualify for discounts. Handicap access: the gardens and ground floor of the chateau is accessible to wheelchair users. Dogs on a leash may enter the gardens but only smaller dogs that are carried are allowed inside the chateau. Restaurant facilities on the grounds of Château de Chenonceau include a rather formal Orangerie restaurant, a self-service restaurant, a tea house (late afternoon only) and a snack bar crêperie (outside the entrance gate). These facilities are open usually only from March to mid-November. Taking any food or drink into the grounds of Chenonceau is forbidden – security check any big bags at the entrance. Ample free picnicking facilities are available outside the main gate. Toilets at Chenonceau, like at most Loire Valley chateaux, are rather limited. Toilets are available outside the entrance gates or better behind the restaurant and wax museum. No further toilets are available in the gardens or at the castle itself. 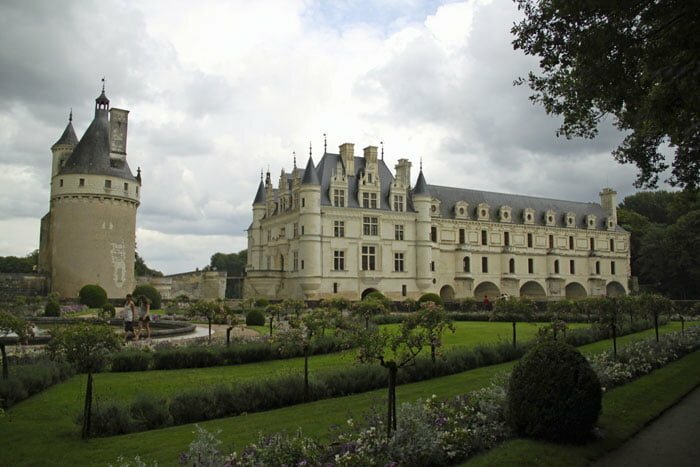 Although Château de Chenonceau has some magnificent art work, real historic importance, a lovely interior, wonderful flower displays, and important formal gardens, it really is the location across the River Cher that makes this specific Renaissance castle so popular. Getting a glimpse of this magnificent building from the main entrance and parking lot is impossible as the view is completely blocked by trees. 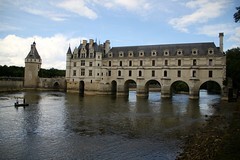 However, the magnificent splendor of Château de Chenonceau can be seen for free from the opposite bank of the River Cher. An unpaved public foot and cycling path runs along the south side of the Cher, which offers the best views of the Renaissance gallery of Château de Chenonceau that spans the river. Visitors to the castle receive a free token that allows them to exit and reenter the castle over the drawbridge at the south side of the Cher. However, it is impossible to buy a ticket here or to enter the castle for the first time from this side of the river.